Dodging Bullets finished strongest to give trainer Paul Nicholls a ninth win in the Tingle Creek Chase at Sandown. Sam Twiston-Davies's mount challenged long-time leader Somersby with two fences to go and held on up the Sandown hill to win at 9-1. The six-year-old, who was bred by former champion flat jockey Frankie Dettori, won by two-and-a-half lengths. Stablemate Hinterland was third under Noel Fehily to ensure another big day for Nicholls. In the absence of Sprinter Sacre and Sire De Grugy the Grade One two-mile race was wide open but Nicholls, who enjoyed great moments in the past with the likes of Kauto Star and Master Minded, had his horses in top form. Twiston-Davies said: "Paul has had a great Saturday, and it's great that I can do my bit as well. "It was a lovely race to ride in, they went at a nice gallop and I always had one to aim at, so it worked out well. This is why this is an amazing job - to ride horses like this, I'm very lucky." 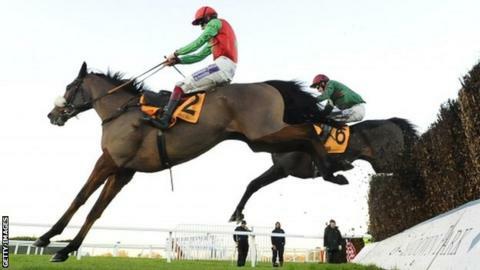 Former Aintree Hurdle winner Oscar Whisky suffered a fatal injury after falling during the race.